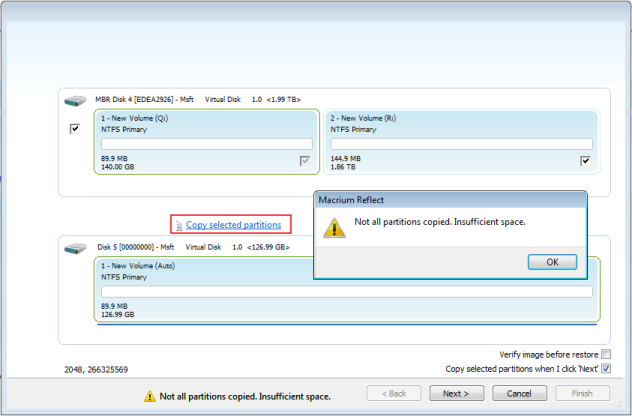 In the following example, all partitions from a 2TB source disk are copied to a 127GB destination disk by clicking the 'Copy selected partitions' link.? Taking the 'Copy selected partition' option will always attempt to placethe restored partition at exactly the same offset as source. Note: The same result occurs by clicking the 'Next' button with the 'Copy selected partitions when I click Next' option selected. 1. At least one of the source partitions selected starts at an offset beyond the size of the destination disk. 2. OR, the result of the copy operation would shrink the last partition due to the destination disk size and there is too much data on the source file system to allow the file system to shrink by that amount. In the case above, the first partition is copied successfully and shrunk from 149 GB to 127 GB (the size of the destination disk) but the second partition, which starts at offset 149 GB, cannot fit on the destination disk. Note: The same error would occur if just a single partition were selected for restore and that partition starts at a position that is greater than the size of the destination disk. Taking the 'Copy selected partition' option will always attempt to placethe restored partition at exactly the same offset as source. In this case just drag and drop the single partition to free space on the destination disk. In this case, to overcome this problem it's necessary to copy the first partition, shrink it to make space for the second and finally drag and drop the second partition in the space now available. 2. 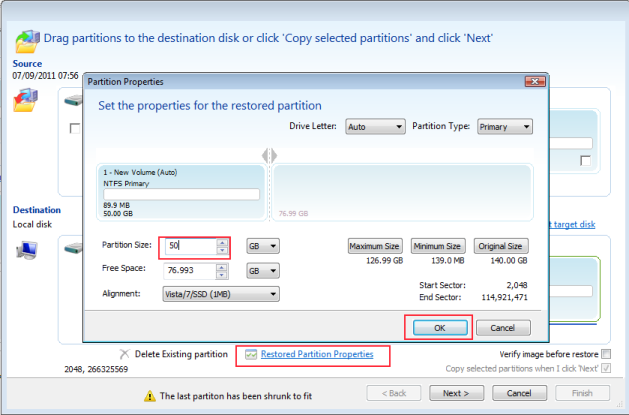 Click 'Restored Partition Properties', change the 'Partition Size' value in the 'Partition Properties' dialog to make room for the second partition. In this case we have resized the partition to 50 GB leaving 77 GB free for the second partition. 3. Finally, drag and drop the second partition to the free space just created. 4. Once the second partition has been dropped on to the target just click 'Next' to continue with the restore.